Have you noticed dry, rough patches on your skin as you get older? 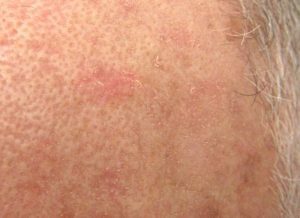 You might call them sunspots or age spots, but they are actually known as actinic keratosis. Caused by sun exposure, this condition causes skin cells to become overgrown and form bumpy tan, brown, or pink areas. Actinic keratosis is characterized by raised lesions, whereas liver spots are flat. Actinic keratoses most often develop on the hands, face, neck, and other areas that tend to get a lot of sun exposure. About ten percent of actinic keratoses lead to squamous cell carcinoma, a type of skin cancer. This condition is more common among those who are older than 60, have a light-colored complexion, and/or have human papillomavirus. You are also more likely to develop actinic keratosis if you have spent a lot of time in the sun, have a history of sunburn, or sunburn easily. Actinic keratosis is preventable. Protect your skin whenever you are in the sun by wearing long-sleeved shirts and pants made from loose, light material along with a wide-brimmed hat. Exposed areas should be covered with sunscreen of at least SPF 30, even on cloudy days. If you think you have actinic keratosis, our doctors may be able to diagnose this condition with a visual evaluation. We may also order a biopsy to determine if any growths are cancerous. Seek medical treatment right away if you notice bleeding, redness, hardened skin, ulceration, swelling, or rapid growth in the affected area. Talk to the team at The Dermatology Clinic if you’re concerned about sunspots or other unusual growths. Contact us at (225) 769-7546 to schedule your consultation.